It's called "/5C" the new series of kneading machines produced by IPM Zamboni, a traditional mark that clearly expresses the points of strength of this line of products: characteristics of reliability and sturdiness, besides unique functionality and versatility. Being developed within the research and development program of the line LOBO, the version "/5C" is already marketed in Europe and South America for dough-sheets of width 1000 and 510mm, and is now ready to also challenge every demand of the market with its version for dough-sheets of 600mm too. The new series "/5C" arises from a simple yet revolutionary project: the idea of a traditional kneading machine is in fact exceeded to come to the concept of "multi-product" kneading machine, able to satisfy different demands of production thanks to characteristics of versatility and efficiency unequalled in its category,… or thanks to its "vivid personality". LOBO/5C is in fact a machine suitable for the treatment of dough either of flour alone or of bran alone or, for those who try to realize an "amusing" product, for the treatment of dough with other ingredients even in pieces. 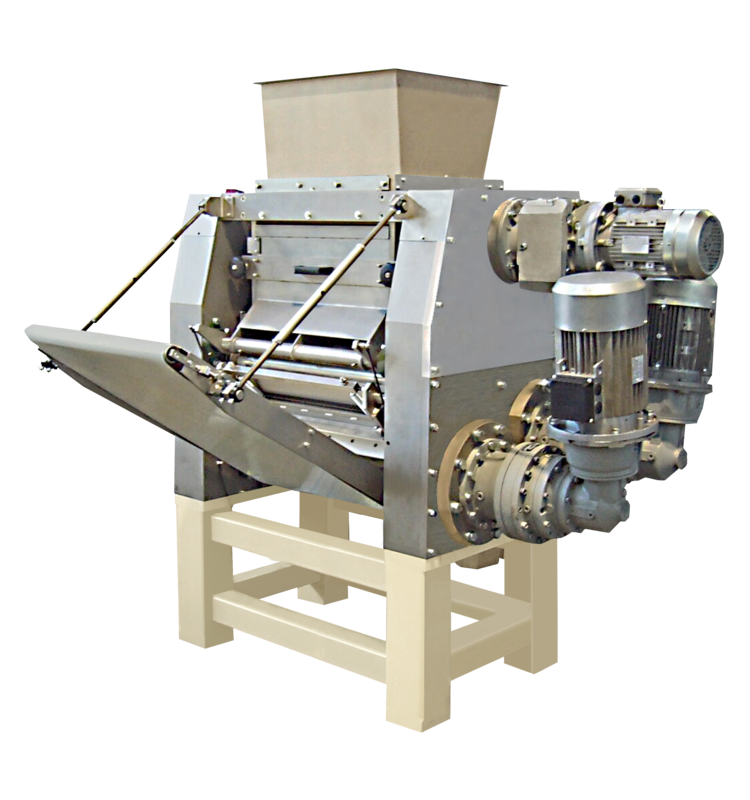 To conclude, it is the kneading machine with which you can do all what pops into your head, just what you are expecting from a multi-function machinery, because it is manageable and gives the possibility, by only changing the parameters from the control panel, to realize different types of dough-sheets or to treat different raw materials. Original and rational, the construction of the LOBO/5C also differs for the materials and the used specific treatments, that grant it full conformity for the use in food field. At the same time, the aggressive and strong design doesn't jeopardize the general impression of innovative machine, so its aspect of solid and well "placed on earth" machine is counterbalanced by a "quick" control's software that makes its operation easy and intuitive. Thanks to its "generous" kneading section, the kneader is self-sufficient to be directly coupled with a group of doser + centrifuge (MFA) for the use with flour while in the case of bran a special additional kneading tank is interposed (VSU). A compression chamber guarantees an exceptional dough-sheet as for quality and elasticity. A powerful calibration unit produces such a thin dough-sheet that it can be used directly by the most production machines (machines for nests or twisted noodles, or stamping machines …) set afterwards. Furthermore, for a maximum of versatility, the LOBO/5C has autonomous motorizations both for the lobe cylinders and for the calibrating cylinders and this allows to realize different recipes with different relationships among the various speeds to be able to have "a different kneader for every different mix."